David Villa's 400th professional goal in the first half ended up being the game-winner for NYCFC. New York City FC: Johnson; Sweat, Callens, Ibeagha, Tinnerholm; Ring, Herrera, Moralez; Berget (Wallace, min, 73), David Villa (Abdul-Salaam, min. 87), Medina (Ofori, min. 73). FC Dallas: Maurer; Nedyalkov, Ziegler, Hedges, Reggie Cannon; Lamah, Ulloa (Barrios, min. 76), Hayes (Gruezo, min. 53), Mosquera; Urruti (Diaz, min. 46), Colmán. SCORE: 1-0, min. 3, Medina. 1-1, min. 10, Mosquera. 2-1, min. 36, David Villa. 3-1, min. 69, David Villa. 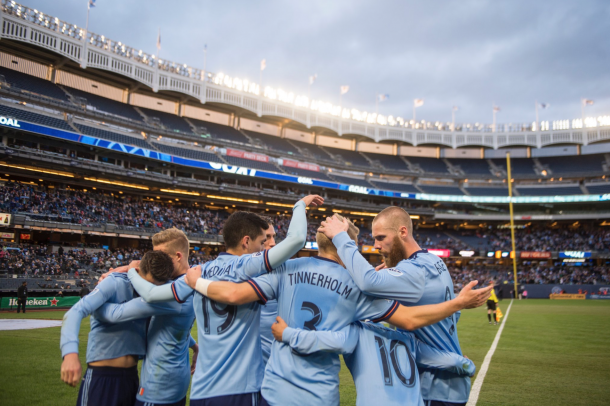 On Sunday, New York City FC welcomed FC Dallas for a battle between two of MLS most impressive sides early in this young season at Yankee Stadium. NYCFC lost their unbeaten start to the season last weekend as they were trashed 3-0 by the Portland Timbers at Providence Park. NYCFC were without key defender, Maxime Chanot, while FC Dallas were midding key players as well including a pair of homegrown players, turned stars in Jesse Gonzalez and Kellyn Acosta. The game got off to a quick start as NYCFC grabbed the lead in the third minute. David Villa picked the ball off of Jacori Hayes before isolating himself on the wing with the former Wake Forest man. The captain then nutmegged Hayes, played a give-and-go with Ben Sweat and centered it to Jo Inge Berget. The Norweigian's shot bounced off the post but Jesus Medina pounced on it to give his side an early lead. An excellent team goal from the blue side of New York quickly showed the visitors what NYCFC was capable of. It didn't take long for Dallas to equalize as FCD put their young flashy South American display showing NYCFC that Medina wasn't alone. Yangel Herrera's backpass was intercepted by Maxi Urruti who started the counter. A simple pass to Santiago Mosquera left the Colombian alone with Sean Johnson and the 23-year-old made no mistake for his first career MLS goal. Despite the exciting start, things slowed down for a bit as no huge goalscoring chances occurred for a bit. In the 33rd minute, Anton Tinnerholm took the ball down brilliantly before cutting in to take a shot. Reto Ziegler turned his back as the ball struck his arm. Nothing was originally called but referee, Ismail Elfath, turned to VAR, and pointed to the spot. David Villa stepped up to the spot, and there was never a doubt. Spain's all-time leading goalscorer bagged his 400th career professional goal and his 68th for NYCFC. The only shirt he has scored more goals in would be a Valencia kit, where he wore for five seasons. After that, NYCFC picked up a few more good chances with Jimmy Maurer making big saves on Yangel Herrera and Maxi Moralez to keep NYCFC's lead at just one goal. The two clubs went into the break with the boys in blue holding a one-goal lead. NYCFC nearly doubled their lead five minutes into the second half as David Villa and Maxi Moralez switched roles. The goalscorer turned playmaker when he played it into Maxi's feet, but the Argentine's shot was stopped and the rebound bounced off Moralez and out of bounds. Mosquera had a chance to double his goal tally on the night and equalize for his side. The Colombian easily got past Ben Sweat in the box but had trouble beating Sean Johnson. From close range, Johnson cut down the angles quickly giving Mosquera nothing to shoot at and pushing the shot aside. 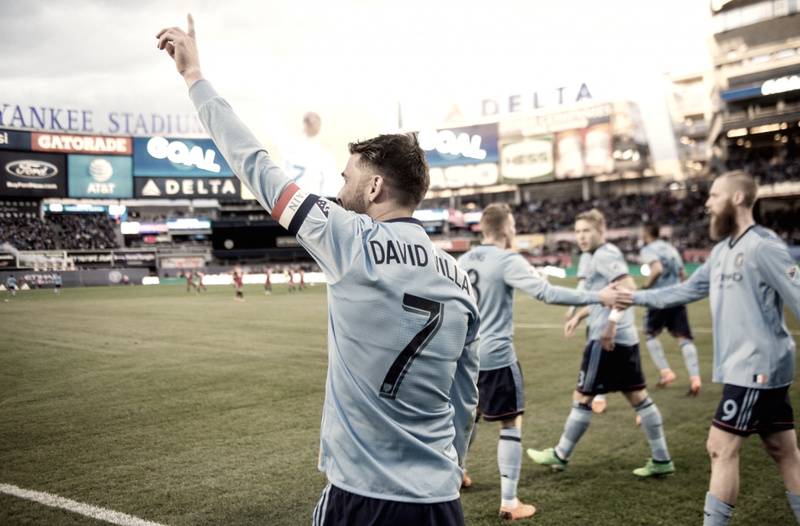 A man who didn't miss a chance to double their goal tally on the night was David Villa. The NYCFC captain pounced on a miscommunication between the FCD center backs and found himself alone with Jimmy Maurer. To nobody's surprise, the Spaniard doubled NYCFC's lead. Sean Johnson made yet another big save in the 79th minute when he stopped a big chance from Cristian Colmán. Luckily for Johnson and his teammates, there were no more great scoring opportunities for either side and the match ended 3-1. For Sunday's winners, they'll cross state borders to prepare for the first Hudson River Derby of the season when they take on the New York Red Bulls. After that, they'll get a glimpse at Banc of California Stadium when they take on new expansion side LAFC for the very first time. FC Dallas, on the other hand, will look to bounce back as they travel to the west coast to meet with LAFC before NYCFC. Then, they'll return home to host the other Los Angeles team as the Zlatan Ibrahimovic and the LA Galaxy pay a visit to FC Dallas.